Happy Tuesday. I hope everyone had a great weekend and, for those who celebrated, a wonderful Mother's Day. I had the perfect day of laying in bed until 11am (yup), enjoying a peaceful cup of coffee, a great work out, an in home spa treatment (well, I gave myself a facial mask, but we'll pretend it was more exciting), and cocktails while face timing with my mom and family. It was the perfect, relaxing day. Now I'm back to the reality of chasing around two toddlers, while trying to get a millions things done during the day. If you read Friday's post, I talked about one of my favorite Boston boutiques, Shake The Tree, which is located in the North End. When I was last there, I snagged this off-the-shoulder top, which happens to have all of my favorite spring trends in one. 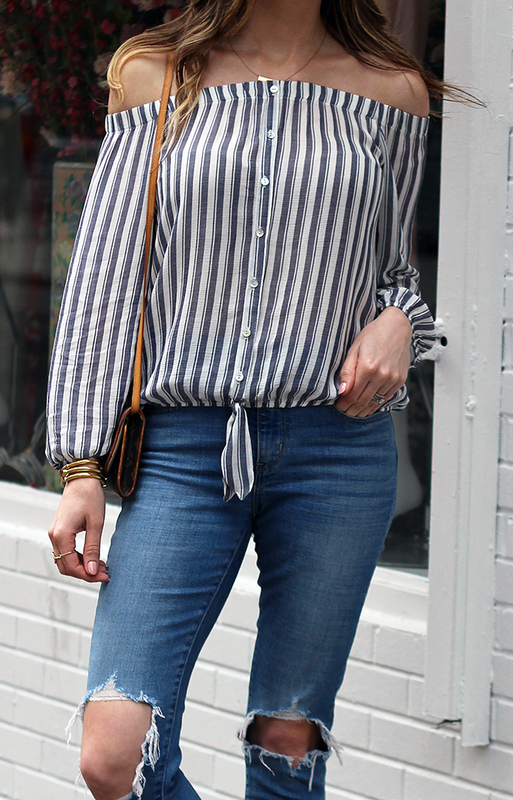 I can't get enough of the stripes, off-the-shoulder cut, button up front, and tie detail. The best part about this top, besides the fact that it's under $80, is that the material is very light weight, which means I'll be wearing it all summer long. I wore this off-the-shoulder beauty when I was in NYC the other weekend. I paired it with my favorite distressed jeans, then finished my look with espadrille wedges (which are a great Chloé dupe for under $60). It was the perfect spring look for getting brunch, and exploring the city's lower east side. If you live in the Boston area, make sure to visit Shake The Tree, as you won't be disappointed. You can read more about the boutique in my last post, here. Also today is the last day to enter the $500 Amazon gift card giveaway. For details and to enter, click here. Love this outfit. That top is so cute!!! You look awesome! Lovely shirt!! You look gorgeous! I love the stripes and the button detail, so cute! This outfit is the definition of casual perfection. I love those pants so much - I need a good medium wash pair with mild distressing. Pair them with that adorable and effortlessly gorgeous top and you've got one winner outfit! I totally need it all. Too bad I'm not closer to Boston! Love this striped top! It looks fabulous with distressed jeans! I have those wedges and love them! They are so comfortable! Love that top on you! Sounds like you had an amazing Mother's Day! Love the top - such cute detailing how it knots in the front! You look great!! Such a chic casual look!! Love your top and the tie detail! So cute! I just love this top!! I bought a tie front one recently too. It doesn't have the fun OTS detail though. ;) The stripes are so great. Glad you had a nice Mother's Day! 11 am?? I am so jealous right now haha. Whenever I make my way down to Boston, I need to check this shop out. I've been loving everything you have post from them! Cute stripes and love the front tie too! Oh wow 11? That's awesome. I can't even remember the last time I made it past 8:30!! You look adorable as always in that top. Love the front tie! What a lovely outfit!! It looks good on you! Beautiful look! Love your top, and your jeans are fabulous! Pretty top, Rachel! I love the buttons and tie front detail! Loving this off shoulder top.